Cats on a Leash Return with GATOS LOCOS! “Trying to get a group of artists to work together is like trying to walk a bunch of cats on a leash”.With that statement as the driving force, a select group of SC artists drew together in 1985 to establish a creative synergy that continues to pull them together today. The artists are:Jeri Burdick – clay and mixed media, Eutawville; Clay Burnette – pine needle baskets and handwoven scarves, Columbia; Heidi Darr-Hope – magical amulets and talismans, Columbia; Clark Ellefson – lamps and tin robot things, Columbia; Judy Hubbard – batik and textile assemblages, Columbia; Lee Malerich – mosaics and textiles, Neeces; and Marcy Myers –mixed media, Lexington. They are more than friends. They encourage each other to color outside the lines and the invitation to this exhibition is the product of this philosophy. 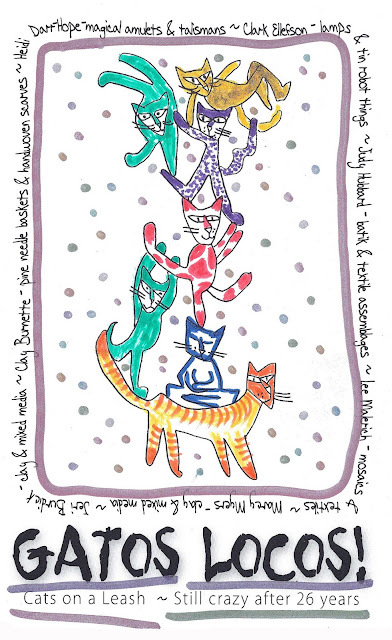 Each black and white card was individually doodled and embellished– definitely in “Off Leash” style. 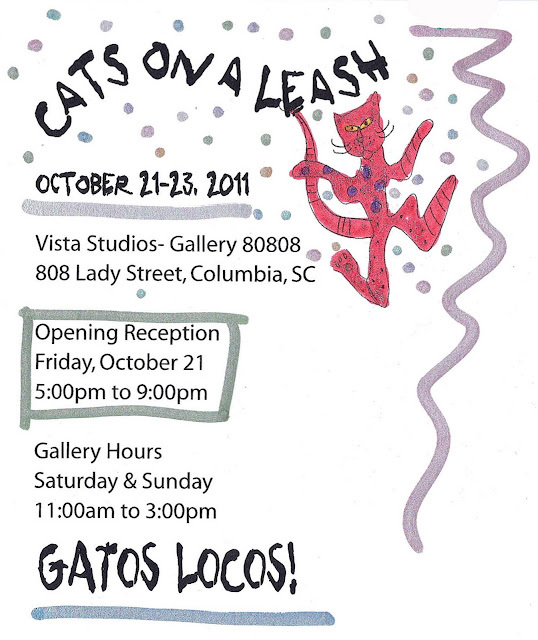 The upcoming Cats on a Leash exhibition will be held at Gallery 80808 – Vista Studios on Friday, October 21 through Sunday, October 23, with an opening reception on Friday from 5to 9 PM.The show will continue on Saturday and Sunday from 11AM to 3 PM. When not exhibiting together, the individual artists remain committed to their own personal art careers. Collectively, they have shown in more than 600 exhibitions nationally and internationally, received more than 40 grants and fellowships, appeared in more than 225 books, magazines and newspaper articles, received over 100 commissions from corporate and private collectors, developed almost 300 workshops and lectures and participated in almost 100 active memberships on boards and committees. They have established and managed small art businesses and have set a standard for proactivism in the arts and community that is pervasive and commendable. 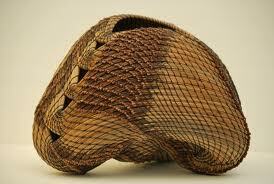 Two are Verner Award winners, the top South Carolina governor’s award for the Arts. As a group, their creative energy has pulled them together for almost three decades – with no end in sight.